Jordi Gual: "The financial sector will play a key role in the ecological transition"
"The ecological transition must be a fair one. Our society can lead it, but we need to be able to adjust the rhythm to make sure no one is left behind". Jordi Gual, chairman of CaixaBank, highlighted this as one of the main concerns during the workshop 'Ecological transition:the challenge of sustainable financing', held in CaixaForum Madrid. 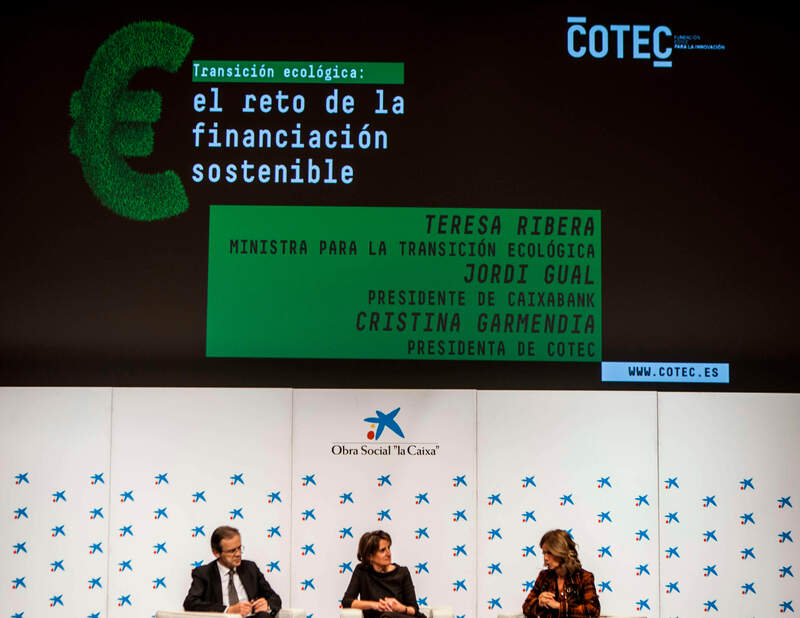 The event, organised by the Fundación Cotec in collaboration with CaixaBank, also included talks by Teresa Ribera, minister for Ecological Transition; Cristina Garmendia, chairwoman of the Fundación Cotec; and Laurent Fabius, former French prime minister and president of the UN Group of Experts for the Global Pact for the Environment, who was introduced by the Minister of Foreign Affairs, the European Union and Cooperation, Josep Borrell. All the speakers concurred that the fight against climate change was one of the main challenges of global society. A race against the clock, where the role of states, companies, organisations and citizens is fundamental. The recent 24th Climate Change Conference (COP24), in Katowice (Poland), established a range of actions to measure the degree of fulfilment of the Paris Agreement to fight against climate change. This pact specifically was promoted at the time by Laurent Fabius himself, present at CaixaForum Madrid, who highlighted the important role of financing when meeting the objectives of the agreement. "We need to invest in technology, education and infrastructure... Society as a whole must push in the same direction, it is not just the responsibility of governments", highlighted Fabius, who also underlined financing as the motor of ecological transition. "The climate change actions of the European Union alone require more than 100 billion euros per year to stick to the mitigation objectives towards 2030". This is a message that the CaixaBank chairman and the minister for Ecological Transition also agreed with. For Jordi Gual, “the financial sector will play an essential role in the ecological transition because it is the element that connects savings with investment". Meanwhile, Teresa Ribera described the financial system as "the bridge that will take us from the current reality to the reality of tomorrow". How can the financial system help? Another key point of the workshop was the role that financial institutions can play when establishing sustainable financing that supports the fight against climate change. Jordi Gual emphasised four specific fields of action where these companies can take action, and where CaixaBank is already active. The first of these is the environmental impact of the financial institutions themselves: "We are not a particularly contaminant industry, but we can improve. 99% of the energy used by CaixaBank is renewable, and it has also reduced its emissions by 70% over seven years". He also highlighted investment funding and advice to investors as two strategic levers that financial institutions can use. "We can provide companies with environmental objectives. In fact, we have already done this through instruments such as green bonds or microcredits for sustainable projects, among others", he explained. In this respect, he called for clear guidelines from the public sector to measure the climate risk of the activities funded by these institutions. "We would like to see the development of clear categories, to find out which assets meet ecological requirements. We have the capacity to help our customers to acquire assets that end up funding environmental aid", he said. Thus, he emphasised the need for a stable regulatory framework that informs companies where to place their resources. Transparency was another aspect highlighted by Jordi Gual: "We must communicate what we are funding and which financial assets we distribute. Until we have clear guidelines, this is a huge effort". For Teresa Ribera, clarity is also essential in matters such as measuring obligations in non-financial reporting. "The European Union is already preparing a regulatory proposal on how to inform shareholders on climate change", she added. Ordi Gual, President of CaixaBank, Teresa Ribera, Minister for the Ecological Transition, and Cristina Garmenda, President of COTEC. Energy transition cannot be done from one day to the next. It is a process with many steps, which companies and citizens must follow. This is the concept of a just transition, one of the most sensitive topics discussed during the workshop. "If countries want decarbonisation, simply setting an objective is not enough. We also need to foresee the effects of this transition on society and prepare countermeasures", according to Laurent Fabius. Specifically, the expert referred to the crisis of the Gilets Jaunes in France. "The increase in fuel prices due to taxes was the trigger, although nobody's talking about that anymore", he said. For Jordi Gual, 'the ecological challenge means that many resources used for environmental objectives are not used for other objectives. We must avoid a negative impact by using money correctly and compensating social sectors that may suffer". Teresa Ribera agreed that 'this is a race against the clock and we must accelerate the change to meet the objectives of the Paris Agreement. However, we need to do everything in a socially inclusive way". Sustainability and climate change are top priorities for global society, which is something that all speakers agreed on. Just as Cristina Garmendia highlighted during her talk, "both are present in six of the 17 Sustainable Development Goals (SDG) established by the UN. Its impact is transversal, given that it affects every part of our lives". It is a challenge in which financing is essential, and which will require 'an unprecedented effort', in Fabian Laurent's words. "Sustainable financing is fundamental for the fight against climate change, as it is essential for decision-making. For every dollar we invest, we avoid between four and six dollars in damages", he explained. Although time is running out to reverse climate change, there is still hope. Dialogue, transparency and innovation will be fundamental in creating a consensus among key players when putting an end to this threat. Financial institutions in particular have a lot to offer in this regard, with the support of the public sector and citizens.